Trees and shrubs that have cones instead of flowers. 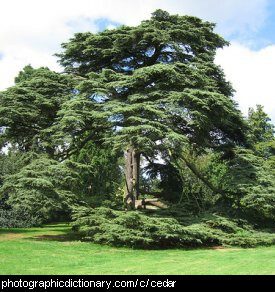 Cypress are a group of conifers. 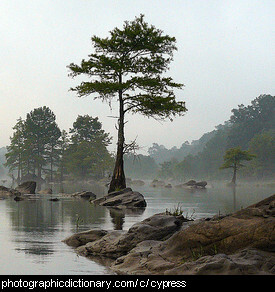 Most cypress are trees, but some are low growing shrubs. Many varieties of cypress have a distinctively flared trunk, narrowing as it goes higher. Not to be confused with Cyprus. 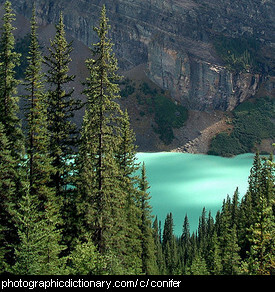 Junipers are conifers in the cypress family. Junipers range in size from small shrubs to large trees. They are very popular as bonsai plants. 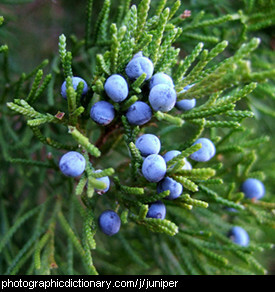 Some kinds of juniper have aromatic edible berries that are used as a flavoring for drinks such as gin. 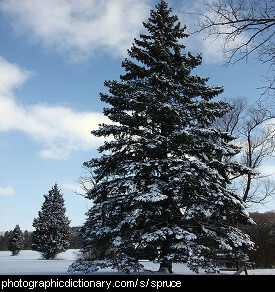 Pine trees or conifers come in all shapes and sizes, although most are quite large trees. They all have some features in common. They all have cones instead of flowers. They all have leaves that look like thin green needles. Most pine trees grow from one central point at the top of the tree only and do not branch, which gives most pine trees a distinctive cone shape. Some species do branch, but not as much as most other trees do. Because pine trees usually grow tall and straight without branching they are commonly grown as plantation timber to harvest their wood for building houses and furniture out of. 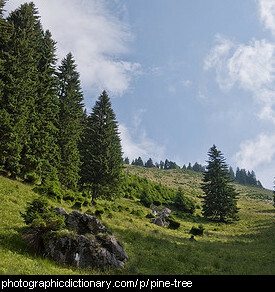 Spruce are large conifers, found in cooler regions of the world. Some kinds of spruce can grow to be 200 feet tall. 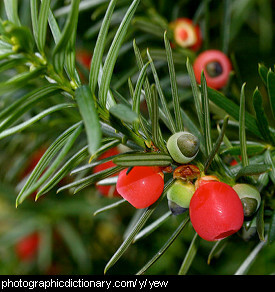 The yew tree is a kind of conifer originally from parts of Europe, Africa, Iran and Asia. It is a small to medium, slow-growing tree, reaching around 10 to 20 metres high. The leaves and seeds of the tree are very bitter and poisonous. 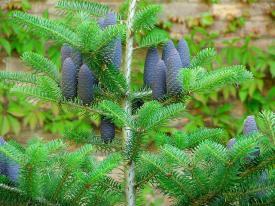 The yew's pine cones are unusual, being more like a berry with a single seed. The berries are eaten by some kinds of birds.